Thompson Station is located approximately 25 miles south of Nashville, amid the rolling hills and pastoral countryside of middle Tennessee, the inviting Town of Thompson’s Station is a great place to live. 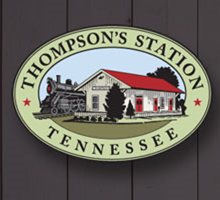 Thompson’s Station is steeped in history, from its earliest settlers in 1780, to the stirring Battle of Thompson’s Station and as a stop along Tennessee’s Great Train Trail. The town’s tranquil environment and convivial atmosphere is worlds apart from hectic urban lifestyles, yet still near to everything the world-renowned “Music City” and surrounding communities have to offer. Bridging both storied past and promising future, Thompson’s Station prospers through its historic heritage and proximity to Nashville, Franklin and Spring Hill. As more and more new residents began moving into the area, Thompson’s Station held an incorporation referendum in 1990. The measure received overwhelming approval and, on August 15 of that year, the community officially became The Town of Thompson’s Station. The Town is governed by the Board of Mayor and Aldermen (the mayor and 4 aldermen). A total of 2,679 town residents were certified by the 2013 census. Franklin Environmental Services in proud to offer mold removal, radon testing & radon mitigation services in Thompson Station TN. We perform mold remediation services, radon testing and radon mitigation, crawlspace moisture barriers and crawlspace encapsulation. We work with homeowners in Thompson Station TN to ensure their homes are safe and secure from the dangers of mold and radon, and protected against intrusive moisture. Homeowners living in Thompson Station face unique challenges when it comes to preventing mold from getting in their home. In Tennessee, there are over 100 types of mold that can attack your home both inside and out. It’s important keep an eye out for damp spots around your house, both inside and out. The best thing to do at the first sign of moisture is to take steps to dry out that area, and then call an expert. Franklin Environmental Services is certified by the Professional Mold Inspection Institute to handle all mold related issues you may face. Franklin Environmental Services offers professional radon mitigation services to the Thompson Station area. Since Radon is impossible to detect, your best bet is to call a professional to ensure that you and your family are safe from this deadly gas. Franklin Environmental Services is certified by the National Radon Proficiency Program to perform radon testing and radon mitigation. Franklin Environmental Services is a trusted resource to Realtors looking for a partner. We help get homes mold and radon free and ready to show! We are fast, reliable and discrete. If you are a realtor in Thompson Station TN, we would love to be a part of your winning team!